Have you ever listened to a sermon with friends and family and felt the discomfort in the room? Has the discomfort been so thick that you could cut it with a knife? Has a sermon ever done that to you? For me, it happened a week or so ago. I was with a group of people who I really needed to impress. I won’t go into details, but this wasn’t the best time for a controversial sermon on race. Yes, the sermon was on race in America, and how the church should deal with it. It was candid, informative, but most importantly, it was uncomfortable. The sermon was “Skin in the Game” by Andy Stanley. He brought two African-American Christians, both he’s known for a while, to talk about the issue of race in America. Two police officers were supposed to join the “panel” but declined because of connections with the police department. Honestly, I was happy that they weren’t there. It’s not because I don’t respect or appreciate the opinion of cops. It’s because they would’ve given listeners a comfy ideological hideaway. The last thing you need in a conversation like this is for one side to ignore the other. 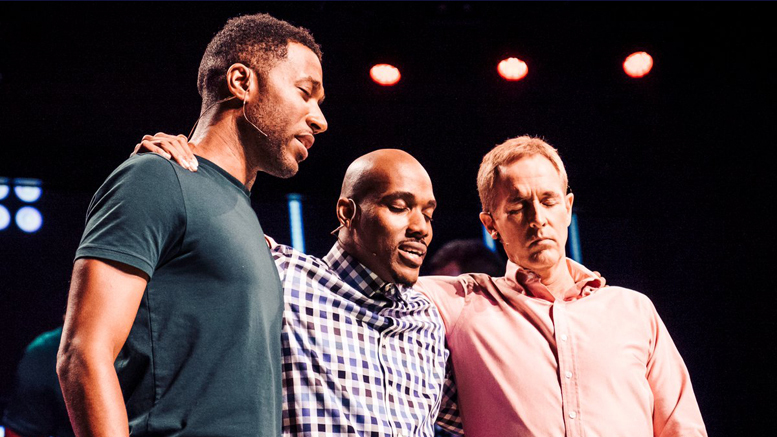 The issue of race in America is a stressful one, especially in the church. Verses like these colorblind the church. It’s all in the name of reducing strife and loving your brother and sister for who they are, not what they look like. Good intentions all around, but as you know from politics; good intentions don’t make good policy. A colorblind church is a restricted church. And it’s evident by the complete lack of sermons on the subject. Yes, your pastor might mention it. But do they ever address it head on? I’ve seen pastors push it to God in a “just pray and hope it gets better” manner. A typical Christian response when you have no idea, or desire to broach the subject. I was surprised my group got through the entire sermon. At least twice, concerns were voiced that the discussion wasn’t connecting anything to the Bible. Discomfort was rearing its ugly head. See, too many times Christians dismiss issues because it can’t be easily connected with a Bible verse or teaching. If the sermon isn’t riddled with verses on the subject, is it even a sermon? Obviously, Stanley connected the discussion with scripture at the very end. A decision that I think was needed. Too often Christians use scripture as a crutch to avoid meaningful discussion. Both guests needed time to voice their concerns, experiences, and opinions without being interrupted. Scripture is important for us to understand the world, but it shouldn’t blind us to the reality of the world and how people feel. The early church faced its fair share of racial tension; a piece of church history that you rarely hear about. During the early church period, you had Gentiles, Jews, freemen (former slaves), slave masters, slaves, and Samaritans (half Jew, half Gentile). And none of these groups got together well. Jews despises Gentiles and Samaritans for being impure. Slaves and slave masters despised freemen, and freemen loathed slave masters. The early church was plagued with these divisions. Not even Peter was above the racial divides. Before visiting the centurion, Cornelius, Peter had a dream in which God declared “What God has made clean, do not call common.” Once Peter arrived at Cornelius’s house, he addressed the issue head on. Peter was a prisoner to the racial strife of the time. Only God could overcome Peter’s prejudices. Let’s not forget Jesus’s actions toward the Samaritan woman (John 4). Not only did he pass through Samaria, a region usually avoided by Jews, but he talked to a Samaritan. Jesus didn’t avoid the situation. He didn’t beat around the bush. God didn’t let Peter off the hook. He didn’t let Peter avoid the conversation that needed to happen. In the centurion’s house, Peter confronted the issue head on. The church needs to confront the issue head on. Congregations need to understand the struggles of their black members. They need to realize that issues exist, and that the church should be at the epicenter of healing it. Furthermore, the church needs to push its members out of their ideologically safe positions. How can the church influence and alter society if it’s too afraid of addressing (or blind to) the big issues? People need to be sat down in front of a sermon and have their narratives challenged. If you complain about the shallowness and tepidness of the American church, this is what needs to be changed. No more colorblindness in the name of congregational comfort.